PUPILS from Edinburgh’s Broughton Primary School are celebrating after they were revealed as winners of the 2018 Edinburgh Marathon Festival Junior Schools competition, defending their title for the third year running. 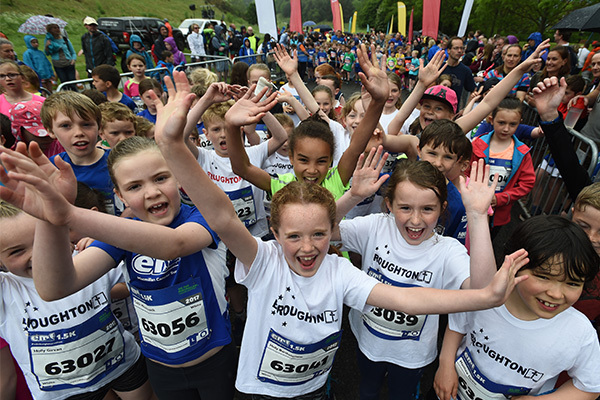 Over 1500 children from schools across Edinburgh, The Lothians and Fife took part in the Edinburgh Marathon Festival Junior Races last May, marking the biggest year in the events’ history. Young runners aged 6-8 took part in the 1.5K race and 9-12 year olds raced over 2K as part of a packed weekend of running last May which also included the 5K, 10K, Team Relay, Half Marathon and Marathon. Due to the success of the events in recent years, two new junior races were introduced to the Festivals line up in 2017- the Junior 5K open to kids aged 11-18 and the Kids’ Kilometre accommodating ages 3-6. EMF mascot, Mr Hairy Haggis, will make a special visit to Broughton Primary School during an upcoming school assembly and award the school with their winning trophy and £150 worth of sports equipment vouchers. Broughton Primary School were first crowned EMF Junior Schools Competition winners in 2016 and have claimed the title each year since. The competition was launched with the main aim to recognise and reward the increased efforts of kids getting active throughout schools in Edinburgh, The Lothians and Fife. Four different Junior races will take place throughout the day on Saturday 25th May at the 2019 Edinburgh Marathon Festival. Entries are filling up fast, with the Junior 2K and 1.5K events already sold out – remaining events are expected to reach capacity in the next few weeks. For more information and to enter, visit www.edinburghmarathon.com. Over 35,000 runners signed up to take part in the Edinburgh Marathon Festival this 26th & 27th May. Runners from all over the world gathered for Scotland’s biggest running festival across an action-packed weekend, which included new city centre routes for the half marathon, team relay and full marathon events. Sunny weather made for perfect running conditions on one of the world’s fastest marathon courses, where for the first time in the event’s history, the Edinburgh Marathon Festival worked alongside not-for-profit organisation ‘Project Africa Athletics’ to bring in developing athletes that may not otherwise get the opportunity to take part in a race with the status of the Edinburgh Marathon. Kenyan Joel Kipkemboi Kiptoo took advantage of both the new route and perfect running conditions to set a new course record, finishing in 2 hours, 13 minutes and 33 seconds. He smashed the previous record by almost 2 minutes, which was set by fellow Kenyan Zachary Kihara back in 2005. American Jeffrey Stein took second place in 2 hours, 21 minutes and 21 seconds, followed by local favourite Michael Crawley in 2 hours, 24 minutes and 43 seconds. The women’s race was dominated by fellow Project Africa athlete Caroline Jepchirchir, who lead from the front with a time of 2 hours, 47 minutes and 35 seconds. The podium was completed by Edinburgh’s Shona McIntosh in 2 hours, 49 minutes and 7 seconds, and Tracy Millmore from Stanley in 2 hours, 52 minutes and 14 seconds. As if running 26.2 miles wasn’t tough enough, seven runners attempted a ‘hairy’ which involves the grand slam of running a marathon, half marathon, 10k and 5k over the weekend. One of them, Luca Basso from Edinburgh, ran for SAMH in memory of his brother who committed suicide at a young age. Fundraiser Amuz Sandhu ran the Edinburgh Marathon for Official Charity, Macmillan Cancer Support. This cause is particularly close to Amuz after the charity supported him through difficult times after he was diagnosed with bladder cancer in January 2016. His mother was also diagnosed with cancer when Amuz was young. It was a Spanish one-two at Sunday morning’s half marathon as Severino Felipe Gomez stormed to victory with a winning time of 1 hour 10 minutes and 37 seconds. Fellow Spaniard Arturo Quijada Gonzalez took second place with a time of 1 hour 10 minutes and 53 seconds, and Conrad Franks finished in third with a time of 1 hour 10 minutes and 55 seconds. Irish Olympian Breege Connolly was the winner in the women’s race with a time of 1 hour 16 minutes and 9 seconds. She was followed by Glenfarg’s Annabel Simpson in 1 hour 16 minutes and 31 seconds, with Dunblane’s Fanni Gyurko finishing in third place with a time of 1 hour 18 minutes and 32 seconds. Inspirational Alice MacNab completed the Edinburgh Half Marathon for MS Society after being diagnosed with Multiple Sclerosis in July 2017 after partially losing her vision at the age of 19. “My vision never fully returned, and I never know what the future means for me. I don’t know if in a year I will still be able to do the things I love such as skiing or going hill walking, the things that most, including myself, take for granted. I have learnt now that life can be unfair, but don’t let it consume you. Saturday saw Holyrood Park bathed in glorious sunshine as 7,500 runners took part in 10k, 5k and junior races, supported by thousands more friends and family savouring the big event atmosphere. Michael Christoforou, 25, of Edinburgh AC comfortably claimed the top spot in the EMF 10K race with a winning time of 31 minutes and 37 seconds. Will Peppercorn clinched second place in 33 minutes and 13 seconds and Lorenzo Masi finished in third place with a time of 34 minutes and 8 seconds. The women’s winner was 32 year old Hana Randakova from the Czech Republic with a winning time of 38 minutes and 49 seconds. Marc Quipp, 18 years of age, took part in the EMF 10K for Teenage Cancer Trust. In January of this year he was told he had a cancer that was a Ewing’s like sarcoma. Marc says the first and only symptom was a lump at the side of his hip which he first noticed in September 2017. The lump grew from the size of a pea to the size of a tennis ball. Tests followed including a biopsy, before the diagnosis that it was a cancerous tumour. Mark is currently receiving treatment at the Teenage Cancer Trust unit in Western General Hospital, Edinburgh, and has recently completed his sixth session of chemotherapy. He is due to have surgery to the tumour in two weeks which has been reduced in size thanks to the chemotherapy. Arron Larkin, 28 from Rotherham stormed home first in the sunshine to clinch the 5K title with a winning time of 16 minutes and 25 seconds. 29 year old Amy Young from Leeds was the first female home with a winning time of 19 minutes and 38 seconds. Ashley Macrae took part in the EMF 5K to raise funds for the Stroke Association after she suffered a stroke last year at the age of 22. She was on holiday in Thailand when, whilst traveling on a bus, her friends noticed her speech was slurred and she couldn’t use the whole left side of her body. They got her to a medical centre so quickly. A year later, with the support of her family, she has just completed the EMF 5K. She is keen to raise awareness of the fact strokes can happen to younger people. Around 1600 youngsters took part in Saturday’s junior races, consisting of the 1.5k for 6-8 year olds and the 2k for 9-12 year olds, as well as both the Junior 5K and the Kids’ Kilometre. 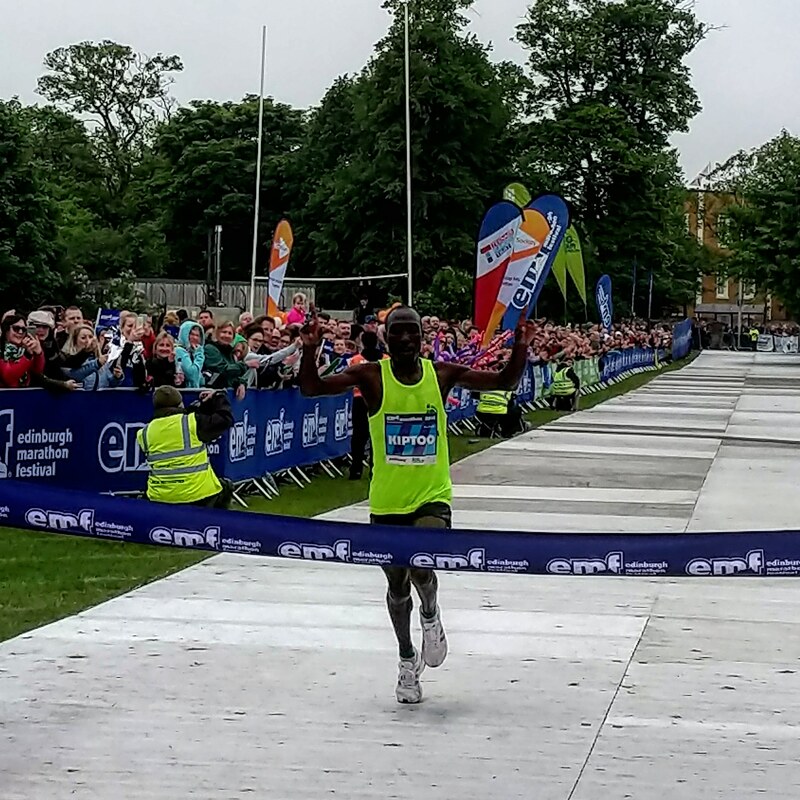 Neil Kilgour, Edinburgh Marathon Festival Director, said: “2018 has been another incredible year for Edinburgh Marathon Festival with outstanding performances, tens of thousands of participants and millions raised for good causes. Runners from the Edinburgh Marathon Festival Official Charity, Macmillan Cancer Support, together with hundreds of other charities, are hoping to raise more than £5 million for worthy causes. An incredible team of 134 runners from the Edinburgh Simpson Centre for Reproductive Health is set to take part in the Edinburgh Marathon Festival on Saturday 26th and Sunday 27th May. The team of staff, family and friends (Team Simpsons) are running various distances over the two day festival. Team Simpsons have runners entered in every race, including all the junior events. 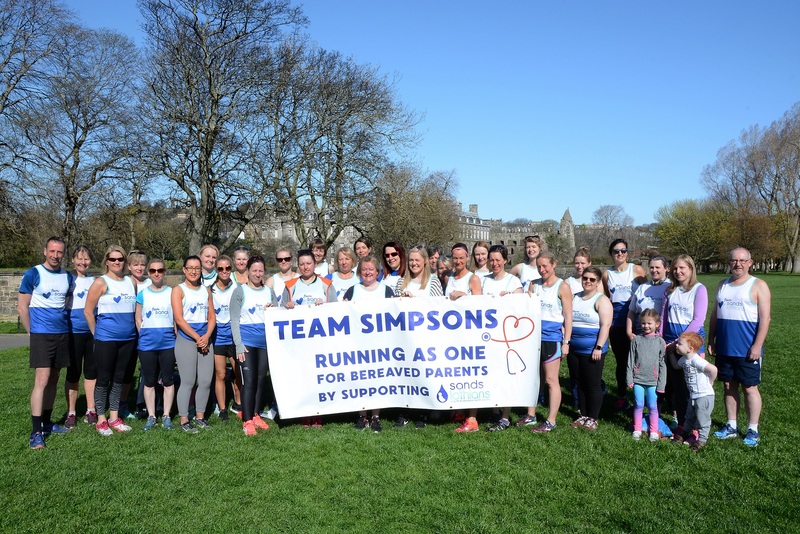 Team Simpsons are running to raise funds for SANDS Lothians, a local charity which provides support for families who’ve experienced the death of their baby. The funds the team raise will be reinvested into the Simpson Centre for Reproductive health to improve the care of bereaved families across Lothian and support for staff. The 134 strong team is made up of midwives, obstetricians, anaesthetists, pathologists, pathology technicians, students, administration and support staff – aged from as young as 5 up to 60 years old. “The team has brought the whole unit together and there is a massive amount of support and camaraderie for each other. The buzz and excitement it has generated is something very special to be part of. Everyone is highly motivated to do their best running for SANDS Lothians.” said Christina. Their fundraising target is £12,000 and have so far Team Simpsons have held various fundraising events including a race night and raffle in Duddingston Golf Club, and an Easter themed cake sale and chocolate tombola on the labour ward at Royal Infirmary Edinburgh, raising over £1400. You can support Team Simpson’s incredible fundraising efforts here: https://www.justgiving.com/fundraising/team-simpsons2. Entries for the 2018 Edinburgh Marathon Festival have now closed, with over 35,000 entrants expected to take to the streets of Scotland’s capital on 26/27 May 2018, raising over £5 million for hundreds of charities.